Another Video from Last year is this one from Covering the General Election as a member of a BBC Leader Team following the Tories on their Campaign trail. 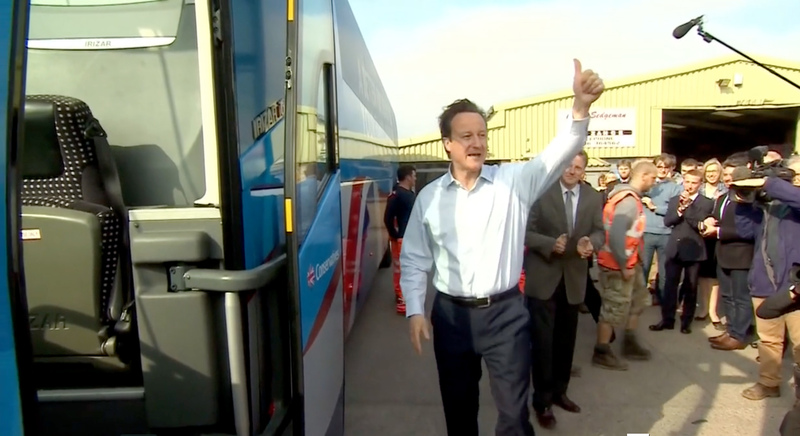 During the nationwide roadshow on the tory Battlebus the Prime Minister and Chancellor visited many places shoring up support for the party faithful before their surprise victory, Gaining power for the next 5 years. The above short piece with the lovely Carole Walker was filmed mainly for online use but clearly illustrated what happened at a large percentage of these campaign visits. Very well stage managed events, orchestrated to minimise disruption and maximise use of the pool camera arrangement, they became very alike no matter what the location and often appeared a lot larger than they actually were. For the Conservatives however, they perfectly served the purpose of providing a daily platform for the campaign message, transmitted through the nation’s press to the voting public. Being part of a BBC leader team for the election was a brilliant experience. We had a great team, stacks of time on the road and met some wonderful people. A real privilege… Being part of the UK Pool every day also meant that when filming he PM on location I knew my footage would be guaranteed to be on every channel that day and night. (No Pressure)! !